Equal rights, a sense of responsibility and opportunities for all. Respect for others, authority, property and the environment. Holding strong values while keeping an open mind. 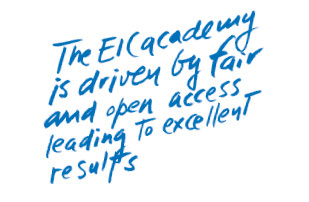 Apart from providing an excellent education, the EIC academy plays a central role in the community. The students, their families and the local community are brought together by the school, chiefly through the ‘Service-learning’ programme. Fair and open access to the school. Facilities: sports areas, an auditorium, study and conference rooms and a library, among other resources. Educational services: counselling, language tuition, conferences and summer camp programmes.